Hello Friends! This is the LINK for my PODCAST on SRA International (SRX). Thanks for visiting. Email me at bobsadvicerforstocks@lycos.com if you have any questions. As I like to point out to readers of this weblog, I am trying to do several things on this website. First of all, I like to discuss stocks that look interesting to me as I try to find suitable candidates for investment. Second, I am sharing with you my actual trading portfolio that I have set up to examine the merit of my strategy, and third, I like to review past stock selections to see how they worked out a year later. In order to share my own trading activity with you I try to post my trades as soon as possible under the entry "Trading Transparency". In addition, a few months ago, I started discussing my holdings and my trade history with each holding. Going alphabetically, reviewing one holding per week, I am currently up to SRA International (SRX). Last week I reviewed ResMed (RMD) on Stock Picks Bob's Advice so let's take a closer look at my SRX holding! 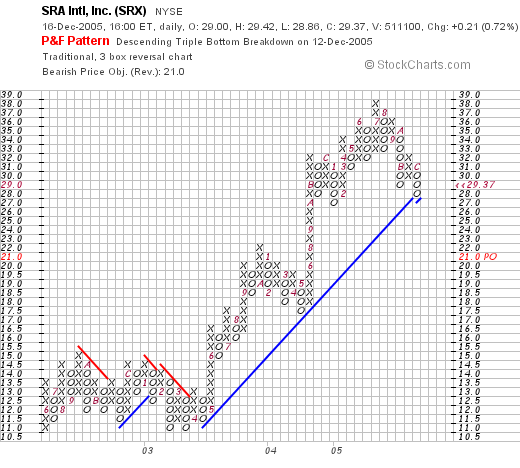 I purchased 320 shares of SRA International (SRX) on 2/1/05 with a cost basis of $29.82/share. SRX closed on 12/16/05 at $29.37, up $.21 or .72% on the day, giving me a loss of $(.45) or (1.5)%. If the stock declines further I will sell at an 8% loss or .92 x 29.82= $27.43. On the other hand, if the stock appreciates 30%, I shall sell approximately 1/6 of my holdings at 1.3 x $29.82 = $38.76. I first discussed SRX on Stock Picks Bob's Advice on June 1, 2004, when the stock was trading at $41.80. SRX had a 2:1 stock split on May 31, 2005, giving that pick a price of $20.90. I "Revisited" SRX on Stock Picks Bob's Advice on June 13, 2005, when it was trading at $34.74. Thus, the stock is above the first pick price, about the same as my purchase price, and below my second "Revisit". "...provides information technology services and solutions in the United States. The company offers strategic consulting; systems design, development, and integration; and outsourcing and operations management. Its strategic consulting services include assessment of current operations, development of strategies and plans for improvement, define key priorities and accountabilities, and design enterprise architectures that capitalize on client investments in legacy systems." SRX does a lot of contracting, including defense contracting, with the Federal Government. And the latest quarter? On November 2, 2005, SRA International announced 1st quarter 2006 results. Revenue for the quarter ended September 30, 2005, climbed 38% from $203.5 million to $280.7illion. Net income climbed from $12.4 million to $14.4 million. Diluted earnings per share jumped from $.22/share to $.25/share this year. How about Morningstar? Reviewing the "5-Yr Restated" financials on Morningstar.com for SRX, we can see the steady revenue growth from $312.5 million in 2001 to $959.0 million in the trailing twelve months (TTM). Earnings have increased from $.63/share in 2003 to $1.03/share in the TTM. Free cash flow has stayed positive with $34 million reported in 2003, and $28 million reported in the TTM. And the balance sheet on Morningstar? Looks fine with $111.6 million in cash and $285.6 million in other current assets, with $165.2 million in current liabilities and the smallish $10 million in long-term liabilities reported. We can see that the stock was moving sideways from June, 2002, until April, 2003, when it broke out higher from the $12 level to a peak of $28. The stock has since sold off and is now challenging the support level of $27. The stock looks o.k., but I would rather see it start trading higher from here! Anyhow, that's another position of mine! A defense contractor that had a great latest quarter, a nice Morningstar.com report, and a reasonable chart. Thanks again for visiting. If you have any questions or comments, please feel free to email me at bobsadviceforstocks@lycos.com or just leave your comments on the blog. Hello Friends! Here is the ***PODCAST*** for the ADOBE entry. I had to finish this one up quickly when the phone rang :). Shows you what an amateur I really am!!!. 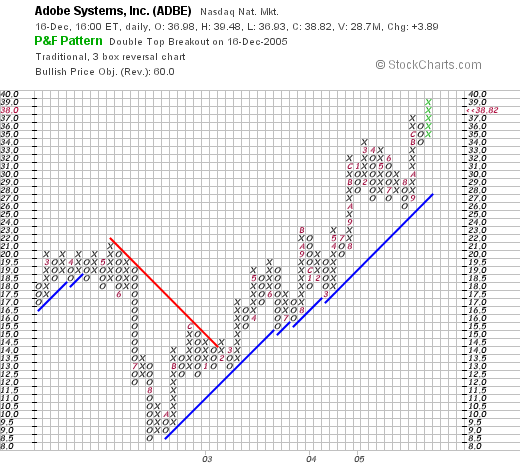 Looking through the list of top % gainers on the NASDAQ, I came across Adobe Systems Incorporated (ADBE) which closed at $38.82, up $3.89 on the day or 11.14% in price appreciation. 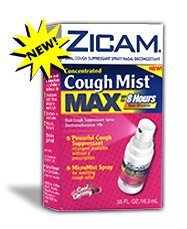 I do not own any shares nor do I have any options on this company. "...offers a line of software and services for public and private sectors worldwide. It operates through four segments: Creative Professional, Digital Imaging and Video, Intelligent Documents, and OEM PostScript and Other. The Creative Professional segment provides software tools for professional publishing,"
As is often the case, what drove the stock higher was the announcement of 4th quarter 2005 results after the close of trading yesterday. Revenue for the quarter gained 19% in the latest quarter to $510.4 million, up from $429.5 million in the same quarter the prior year. GAAP net income came in at $156.3 million for the quarter compared with $113.5 million in the same quarter in 204. GAAP diluted eps worked out to $.31/share, up from $.23/share in the same period in 2004. How about longer-term? Looking at the "5-Yr Restated" financials on Morningstar.com for ADBE, revenue, which was flat between 2000 and 2002 at about $1.2-$1.3 billion, has subsequently increased to the upside in the following three years to $1.9 billion in revenue. Earnings during this period were disappointing between 2000 and 2003 dropping from $.57/share to $.40/share, but have picked up subsequently to $.55/share in 2003, $.91/share in 2004 and $1.11/share in the trailing twelve months (TTM). Free cash flow has also bee growing since 2002 when it was $298 million, this has increased steadily to $639 million in the TTM. The balance sheet? Looks great with $1.9 billion in cash, more than enough to pay off both the $479.1 million in current liabilities and the $46.4 million in long-term liabilities combined more than three times over. In addition, Morningstar reports that Adobe has another $287.9 million in "other" current assets. And "valuation"? Checking Yahoo "Key Statistics" on ADBE, we find that the company has a market cap of $19.18 billion, the trailing p/e is a moderate 35.10, the forward (fye 03-Dec-06) is a bit nicer at 27.15. However, the PEG is 1.86. According to the Fidelity eResearch website, Fidelity is in the "Application Software" industrial group. Even within this group ADBE looks pricey with a Price/Sales ratio of 9.4. This is followed by Oracle (ORCL) at 5.4, Seibel (SEBL) at 4.2, Cognos (COGN) at 3.5 and Hyperion Solutions (HYSL) at the bottom of this list at 3. Going back to Yahoo for a few more numbers on this company, we find that there are 494.13 million shares outstanding but only 33.3 million shares are out short representing 6.80% of the float or 5.4 trading days of volume. This may be significant if you go along with my "3 day rule" of short interest. The company does pay a small dividend of $.03/share yielding 0.10%. The last stock split was a 2:1 split in May 24, 2005. We can see that dip in price during 2002, as the company's financial report dipped, and the strong rise after 2002, after earnings and in particular revenue, climbed. So what do I think? I like the latest quarterly report, the Morningstar.com report looks great with a turn around in earnings in revenue after 2002. Free cash flow is strongly positive and the balance sheet looks terrific. Valuation is a bit rich p/e wise, and the PEG is really out of this world! So this is at least a caution flag to observe as we go about our business. Now, If only I had some cash to be buying some new sotkcs :). But that doesn't really matter, I shall be 'sitting on my hands' until I get the proper signal to make a new purchase from my own portfolio. Regards and be sure to drop me a line at bobsadviceforstocks@lycos.com. Hello Friends! Here is the ***PODCAST*** on Satyam (SAY). Hello Friends! I just created a ***PODCAST*** on "Happy Holidays" An Editorial. Please enjoy and you can comment on this right here on the blog or email me at bobsadviceforstocks@lycos.com. As I like to do when I start looking for a stock to write about on this blog, I reviewed the list of top % gainers on the NYSE today. 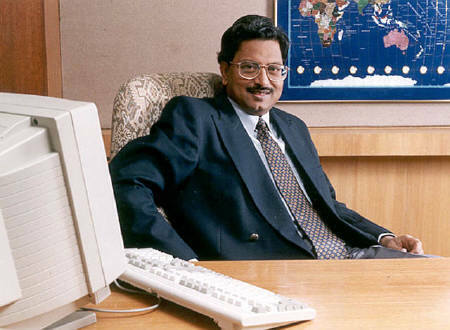 Satyam Computer Services Ltd. (SAY) closed at $36.11, up $1.04 or 2.97% on the day, making the list, in an otherwise unimpressive market environment today. I do not own any shares of this stock nor do I own any options. "Satyam Computer Services Limited operates as a consulting and information technology (IT) services company. Its range of solutions include software development, business intelligence and data warehousing, consulting and enterprise solutions, embedded systems, engineering solutions, enterprise resources planning applications solutions, geographic information system solutions, enterprise infrastructure solutions, and enterprise storage solutions. The company also provides business process outsourcing; Internet access and hosting; and network and network-enabled services." 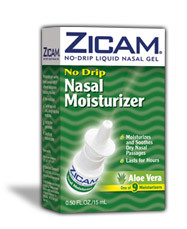 The company is headquartered in Hyderabad, India. Let's take a closer look at this Indian software company that provides extensive outsourcing services. First, the latest quarter. On October 20, 2005, SAY announced 2nd quarter 2006 results. Revenue grew 9.09% sequentially and 33.97% year over year. (many of these results are in Rupees!). 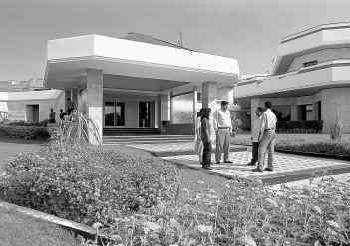 The net profit grew 34.195 year over year, and beat guidance. In addition, the company raised revenue guidance in the same report. As I like to say, this is the "trifecta": increasing revenue, earnings, and raised guidance---about as good a result as one can get from a quarterly report! And how about longer-term results? What does Morningstar.com say about this company? Reviewing the Morningstar.com "5-Yr Restated" financials, we can see that revenue grew from $310.3 million in 2001 to $793.6 million in the trailing twelve months (TTM). Earnings are noted to have increased from $.52/share in 2003 to $.96/share in the TTM. Free cash flow has also improved from $88 million in 2003 to $132 million in the TTM. The balance sheet, as reported by Morningstar.com, looks solid with $129.8 milion in cash, which alone can cover both the $86.1 million in current liabilities and the $30.1 million in long-term liabilities combined. In addition, the company is reported to have $203.1 million in other current assets. And valuation statistics? Checking Yahoo "Key Statistics" on Satyam, the company is a large cap stock with a market capitalization of $5.81 billion. The trailing p/e is moderately rich at 32.24, the forward p/e (fye 31-Mar-07) is estimated at 23.76, and with the rapid growth expected to continue, we have a PEG of only 1.13. Looking at the Price/Sales ratio, for relative valuation within its industrial group of "Information Technology Services", we can see that SAY is very expensive with a Price/Sales ratio of 6.1 per the Fidelity eResearch website. This is followed by SRA International (SRX) at a distant 1.7, Affiliated Computer Services (ACS) at 1.5, Anteon International (ANT) at 1.4, Computer Sciences (CSC) at 0.6 and Electronic Data Services (EDS) at 0.6. Certainly, from the point of view of this particular parameter, the valuation of this stock appears quite rich. Going back to Yahoo for some additional numbers, we can see that there are 160.98 million shares outstanding with 876,910 shares out short representing only 1.3 trading days of volume. This doesn't appear significant to me. In addition, Yahoo reports that the company pays a small dividend of $.23/share yielding 0.60%. No stock splits are reported. We can see that the stock was trading "sideways" between January, 2002, and August, 2003, when it broke through resistance at $12.00 and then moved sharply higher. Once again, the stock showed weakness, dropping from a high of $36/share down to $17/share, until breaking through a new resistance level at around $22 in August, 2004, and moved higher from there. More recently, the stock appears to be moving ahead strongly. So what do I think? The stock is certainly showing strong fundamental and technical strength with a superb quarterly report which also raised guidance, a solid Morningstar.com "5-Yr Restated" financials, including growing free cash flow and a solid balance sheet. Valuation-wise, the PEG being just a bit over 1.0 is encouraging. However, the Price/Sales appears very rich at 6.1, way ahead of other stocks in the same business. With the other performance figures, I still find that the rest of the information outweighs this one statistic. If I were to be purchasing stock, this one might be on my list. However, as you may know, I only buy additional positions when one of my own positions hits a sale point on a gain and I am under my maximum # of positions, which is at 25 posltions at this time. Thanks again for visiting! If you have any comments or questions please feel free to leave them on the blog or email me at bobsadviceforstocks@lycos.com. Hello Friends! Thanks so much for stopping by and visiting my blog, Stock Picks Bob's Advice. I generally spend my time on this blog writing about stocks and investments. And I plan to continue to do so in the future. But from time to time, just as you may see a comment in the Wall Street Journal or the Investors Business Daily, I would like to share a word with you about a perhaps unrelated subject. And you are welcome to respond and add your comments to this discussion. There has been a movement started in this country to defeat the "War Against Christmas" as Bill O'Reilly, John Gibson, Rush Limbaugh, Pat Robertson and others have been explaining. And what is this "War" been doing? Have there been shots fired? Churches burned? Pogroms against true believers? No. The war is simply that some people and some businesses are using and encouraging their employees to say "Happy Holidays". Perhaps sometimes in preference to the more Christian "Merry Christmas". The war includes broadsides against Christianity in the form of inserts in the newspapers advertising sales and toys and maybe even a "holiday tree" instead of a Christmas tree. Of course, the attack on Christmas also includes denial of Christmas in public schools, removal of Creches from the Town Square and making things in general more "politically correct." Is Christmas in trouble? Do we need to rise to the front to defend this assault? What most of these pundits try to gloss over to their readers and listeners is the most important fact that America is a multicultural nation. We have a majority of Christians, a large majority in fact, but we have a variety of religious denominations and many who choose not to believe anything in the religion department at all. When businesses say "Happy Holidays", they are recognizing and indeed respecting the diversity of all of their customers. And that is the American tradition and the freedom that we cherish in America. To respect diversity is to respect tolerance, inclusivity, and yes indeed to respect our love for our fellow man. Insofar as the public space is concerned, keeping religion out of this arena protects both the public that may or may not share this particular message, preventing the "Establishment of Religion" prohibited in the First Amendment, but also protects that religion itself. The development of "Happy Holidays" is indeed a watered-down version of "Merry Christmas" for most people. This is the risk of mixing government and religion as well. We get a secularized version of a religious message. A new religious message that may not make anyone happy. And then we will have each religious denomination lobbying to have its version included or made the exclusive view. So let us continue to work on separating church and state to protect both institutions. So let us encourage the good will and love of this holiday season. Let us respect diversity and not create conflicts that are imaginary to fire up our political base. Wishing all of my friends a very Merry Christmas, a Happy Hannukah, Happy Kwanzaa, Happy Holidays and Season's Greetings! May you all have a wonderful 2006 and may it find us more at peace with each other, with other nations, spending money to find cures for disease, hunger, ignorance, and improving the quality of life for all of the inhabitants on this planet. And may we all seek ways to understand and respect each other, and not feel threatened when some may choose to be inclusive in their holiday greetings! Looking through the list of top % gainers on the NASDAQ, I came across Matrixx Initiatives (MTXX) an old stock pick of mine, that is trading at $20.63, up $1.52 or 7.95% on the day as I write. 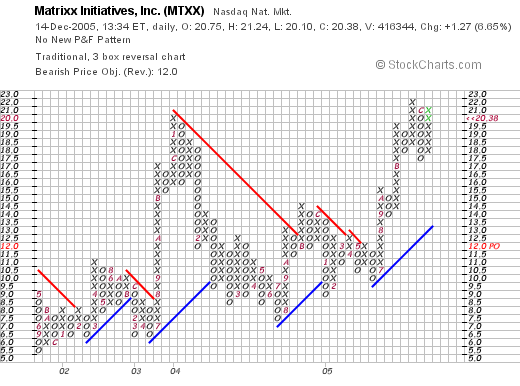 I first posted Matrixx on Stock Picks Bob's Advice on December 29, 2003, almost two years ago (! ), when it was trading at $18.28. The stock actually declined significantly after my post, dropping to as low as $8 in July, 2004, before climbing back to its current level. Matrixx has recently been plugged by Jim Cramer on Mad Money. While I do not always see 'eye to eye' with Jim in his approach, I respect his stock-picking talents, and if we can find a stock that is also on his list, all the more power to us I guess. However, this type of media attention on a stock will only add to its volatility. By the way, I do not own any shares of this stock nor do I have any options or other leveraged positions involving this company. "Matrixx Initiatives, Inc. engages in the development, production, marketing, and sale of over-the-counter pharmaceutical products. 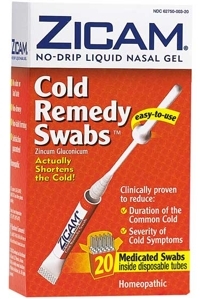 The company, through its subsidiary, Zicam LLC, produces and markets various products, including Zicam Cold Remedy nasal gel, a homeopathic remedy that reduces the duration and severity of the common cold; two related nasal swab cold remedy products, Zicam Cold Remedy Swabs and Zicam Cold Remedy Swabs Kids Size; three homeopathic oral delivery cold remedy products...."
Going through my usual regimen of checking out a company, I first inspected the news on Matrixx, which revealed that the company was raising guidance for 2005! The company now expects revenue for 2005 to grow 45-50%, and fully diluted eps to improve 35-45%. This was an increase in the prior guidance which suggested revenue growth of 25-35% and a 10-20% increase in earnings. I always love to see guidance being raised; the stock price usually follows in the same direction! And how about the latest quarter results? On October 25, 2005, MTXX reported 3rd quarter 2005 results. For the quarter ended September 30, 2005, revenue climbed 49% to $25.2 million, compared to $16.9 million in the year ago same period. Net income came in at $5.6 million, or $.58/diluted share, up from $3.7 million or $.39/diluted share in the third quarter of 2004. These were solid results imho! And what about longer-term? For that I like to turn to the Morningstar.com "5-Yr Restated" financials on MTXX where we can see that revenue has steadily grown from $10.8 million in 2000 to $73.4 million in the trailing twelve months (TTM). During this period, earnings have been a bit erratic, climbing to $1.36/share from $(.91) between 2000 and 2001, then dropping to a loww of $.35/share in 2003, before climbing once again to the current result of $.80/share in the TTM. Free cash flow, while small, has been positive recently with $0 reported in 2002, improving to $4 million in 2003, $7 million in 2004, and $5 million in the TTM. And the balance sheet? As reported by Morningstar, this appears solid with $7.3 million in cash and $35.2 million in other current assets; this is plenty to cover both the $12.9 million in current liabilities and the $.9 million in long-term liabilities. And how about some valuation numbers? Looking at the Yahoo "Key Statistics" on Matrixx, we can see that this is a very small company, actually a small cap stock with a market capitalization of $195.12 million. The trailing p/e is a moderate 25.57, with a forward p/e of 21.88. The PEG is a very nice 0.73. Any time we can get a stock with a PEG under 1.0, that means that the company is growing at a faster rate than the indicated price/earnings ratio. Looking at the Fidelity eResearch website, we find that MTXX has been assigned to the "Drug Delivery" industrial group. Within this group of stocks, with Alkermes (ALKS) at the top with a Price/Sales ratio of 14.4, followed by Nektar (NKTR) at 11.6, Elan (ELN) following next with a Price/Sales ratio of 11.1, Biovail (BVF) at 4.3, Matrixx (MTXX) at 2.5, and Andrx (ADRX) at 1.2. Thus, the stock is reasonably priced by this statistic as well. Back to Yahoo! This is a small company with only 9.59 million shares outstanding. Currently (11/10/05) there are 601,820 shares out short representing 6.805 of the float or 7.3 trading days of volume. Thus, this is significant using my 3 day short ratio cut-off of significance. No dividend is paid and no stock splits are reported on Yahoo. 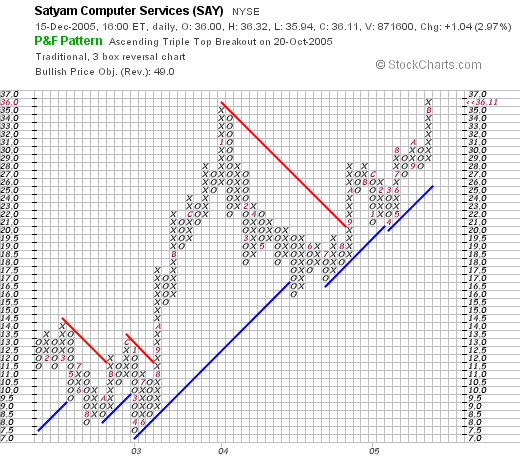 We can see that this stock has been slowly moving higher since mid-2001 when this chart starts. I say this due to the subtle pattern of higher lows and hnigher highs. Since July, 2005, this stock has broken out into higher priced territory at the $21 level. We should note that a similar pattern in early 2004 resulted in the stock price breaking back down to a low of $7 in July, 2004. Overall, the chart appears to be mildly optimistic. So what do I think? Well I like this stock. I liked it back in 2003 (although the price declined after my pick; the situation continues to look solid. Let's review: first of all, this is a Cramer pick so that adds interest from all of his viewers, the company raised guidance, reported a solid latest quarter, has a five year history of fairly strong revenue and earnings growth, free cash flow is positive and steady, the balance sheet looks nice, and valuation, both with a PEG under 1.0, and a Price/Sales near the lowest in its group, appears reasonable. What is there not to like? Thanks again for stopping by! Please be sure to check with your professional investment advisors! If you have any comments or questions, please feel free to leave them right on the blog or email me at bobsadviceforstocks@lycos.com.